How to set up SignalR with Syncfusion EJ1 Kanban control? The SignalR permits bi-directional communication between the server and client. Its availability helps the server to push the content to connected clients instantly. Now, let us see how to setup this SignalR in our Kanban control. Create an ASP.Net MVC application in your Visual studio. Open the Tools -> Library Package Manager -> Package Manager Console and run the following command. This step will add a set of script files and assembly references projects that enables SignalR functionality. In Solution Explorer, expand the Scripts folder. 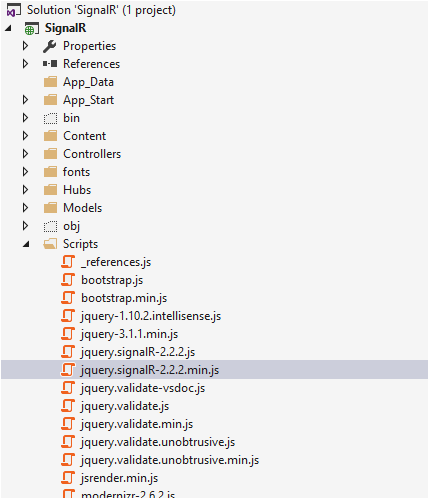 Now, note that script libraries for SignalR have been added to the project. Create a model class in models called KanbanDTO.cs. Right click the solution and select Add -> New Item, then select the Visual C# -> Web -> SignalR node in the Installed pane. Select SignalR Hub Class (v2) from the center pane, and create a new hub named SignalHub.cs. Replace the code in the SignalHub class with the following code. Create a new class called Startup.cs. Change the contents of the file to the following. Then create your Controller and your view, and also add the themes and scripts references for both Syncfusion and SignalR in the Layout.cshtml. Replace the contents of Index.cshtml with the following code. Now save all and run the project.